In 1844, the date of their creation, to 1870 (until the fall of the Second Empire), the Arab Offices held by the militaries have played a key role in the administration of territories of Algeria, left in a complete disorganization by the Ottoman authorities. Arab Bureau gathered judicial fiscal and administrative powers. The Chiefs of Arab offices had thorough knowledge of Arabic and local dialects and have developed academic language skills and cultural role to fulfill their mission of information. Arab Bureau were also intended to enforce the law on the prohibition of slavery which was a daunting task given the impossibility of determining the places of origin where the slaves were removed. Many freed slaves had no choice but to settle in Algeria. Following the fall of the Second Empire, the Arab Bureau entered in opposition to the settlers. The settlers wanted that Algeria be a French territory when Napoleon III believed that it should be part of an Arab nation, whose center could be in Damascus. Napoleon III was suspicious of Europeans in Algeria, saying that there were more reasons to confine them that the natives. In 1870, there were 50 Arab Bureau and the power of the militaries in Algeria was reduced in favor of the settlers whose linguistic interest for Arabic was limited to basic knowledge necessary to exploit the country and the indigenous peoples. From 1870 Algeria, gradually took the colonial shape it had in 1962 when the country became independent. After the fall of the Second Empire the integration policy of Algeria to France decided formerly by the Second Republic was re-applied and the policy of the Arab Bureau policy was abandoned. Commander Bissuel was head of the Arab Bureau, during the imperial period and has maintained an interest for local cultures and languages he presented during his conference of Medea in probably on the eve of his retirement. In the last years of his career, he was appointed as head of a detention facility in Algiers' Fort Bab Azoun "but seemed to have kept good relations with the prisoners and in particular with the Touareg which he had learned the language and writing. From 1955 new Arab Bureau were created SAS (Section administrative specialist) whose purpose was essentially repressive. The TOUAREG are Muslims but have a particular and flexible conception of Islam. 2-While men have their faces hidden by their clothes, women have their faces uncovered. 5-The woman manages her own separate assets without obligation to contribute to family expenses and as a result a woman can be the largest holder of assets in the family. 7-The importance of the social role played by the children depends on the rank occupied by the family of the mother. 8-Although the woman is not a member of the tribe council, women have a notable influence if their opinions and judgments are considered as appropriate. 9-The girls are free to travel and to manage their relations as they wish. 10-On the condition that she fulfills his duties as a mother and wife, the woman is free to travel. 11-Influence of women is such that monogamy has emerged. 12-The assets are inherited by the eldest son of the eldest sister in order to preserve the family patrimony. Some men challenge in words the importance of the role played by women, but it can be assumed that they are bragging about despite reality. The TOUAREG were all able to read and write, and all have knowledge of astronomy that allows them to travel. The TOUAREG had an innate sense of a concise literature. Brevity is reflected also their concern about time management. "Hail Fathma that healed me. May God increase your properties? We all send our greetings to you and yours, for the good action you made for all of us and we will not forget you when we are back on our land." Everything is said in few words forming a concise and delicate text. And for your love I would go to France. For you I will give my horse. The man, who will possess you, will have a sweet sleep. And yet we have seen this miracle this year. A greyhound found a bone and began to gnaw. The bone said: "I am very hard"
I have time, I have nothing to do. " A lion, a panther, a Tahouri and a Jackal were comrades. The Lion said, "Who of us will share this flesh?" "It will be the Jackal, he said, which is the smallest of us"
"Let everyone come and take his part"
The lion came and said to the Jackal, "Where is my share between them?" They are all similar, take the one you like. " Then struck him and killed him. The Jackal was dead, they sought could share the flesh. The Tahouri said: "It will be me"
She mingled flesh of the jackal and sheep and made six shares. "We are three, why there are six shares?" And the third is for "Red Eye" (nickname of the Lion). " The Tahouri said: "The stroke that killed the jackal." The Touareg speak by various dialects of Berber: Azgeur, Hoggar, Kel Ouï, Ouedlimmiden, Kabyle, Shaouia but they understand each other. 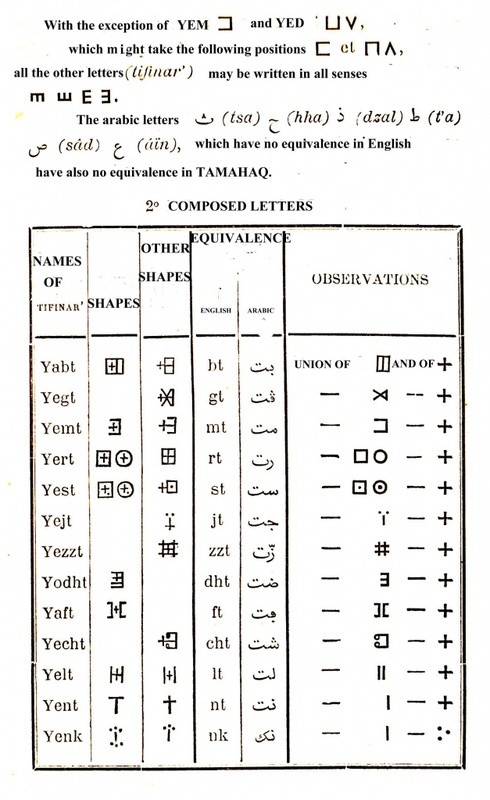 According to their different characteristics the Targuis called their language: Tamacheq, Tamacher't, Tamahaq, Tamajer't or Tamazir't. The Tamacheq is spoken by Ouelimmiden of Adrar and Tamahaq by the tribes of the Ahnet. 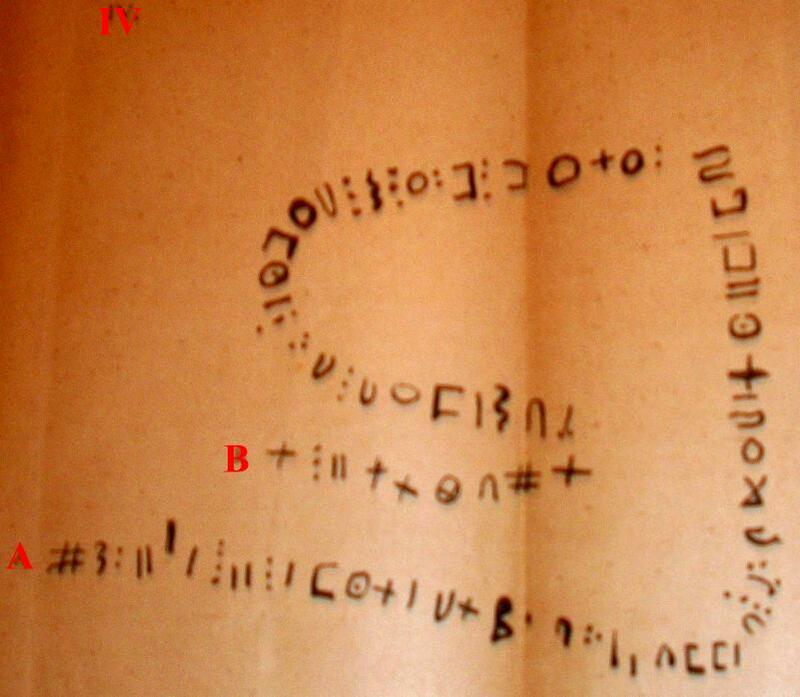 The characters of the TARGUI’s alphabet are called the "Tifinar. '" 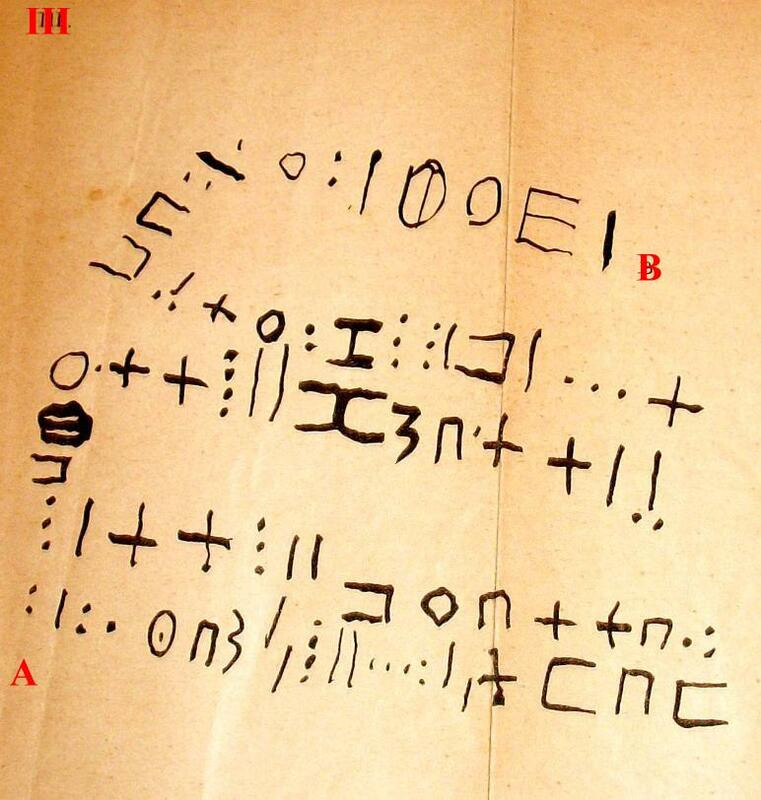 This alphabet was discovered for the first time in 1845. In 1860, Captain Hanoteau, who became later general, published a book of Tamachek grammar. 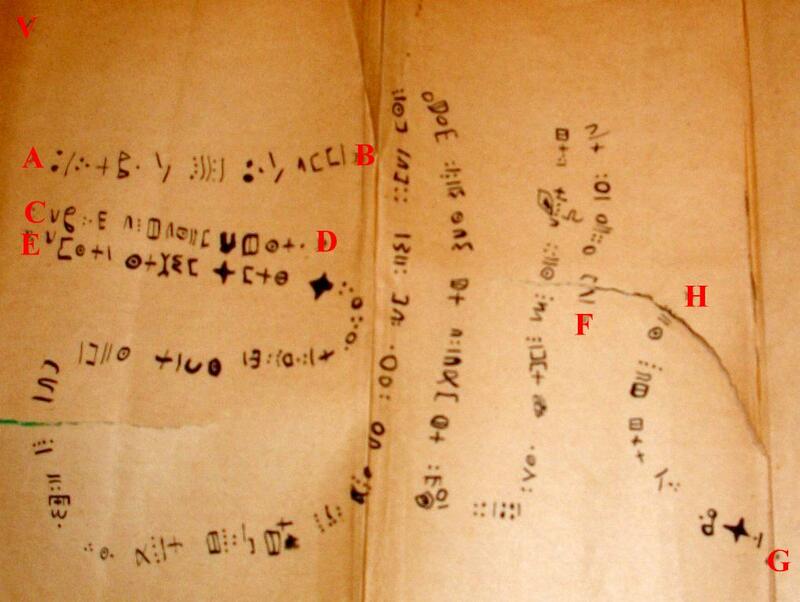 The Tamahaq is written in all directions: up and down from left to right, from right to left, from the upper side to the bottom and the contrary. Sometimes the same text is written in various directions. The lines are continuous writing and may follow curves. 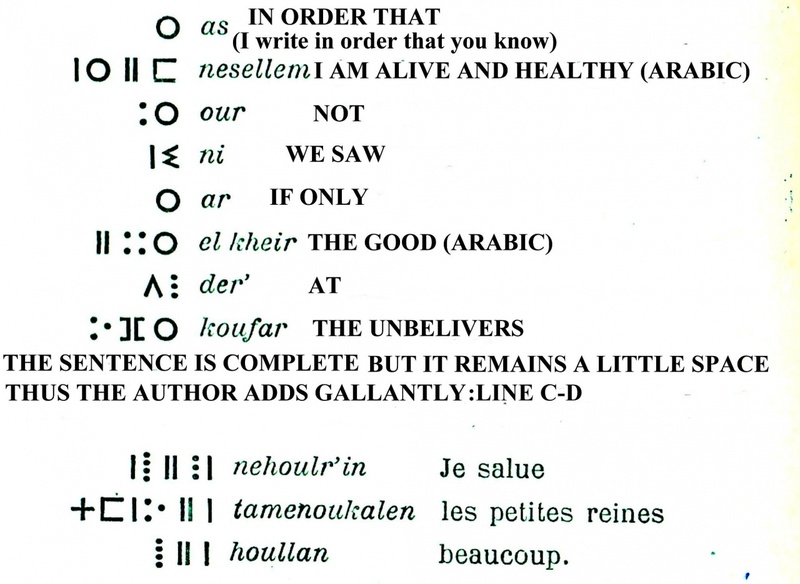 There is no principle of regularity; the Touareg write in front of them and turn the paper when they arrive at its limit in order to continue the sentence to the end in linking the words. The sense on one sentence has a priority as compared to the order. 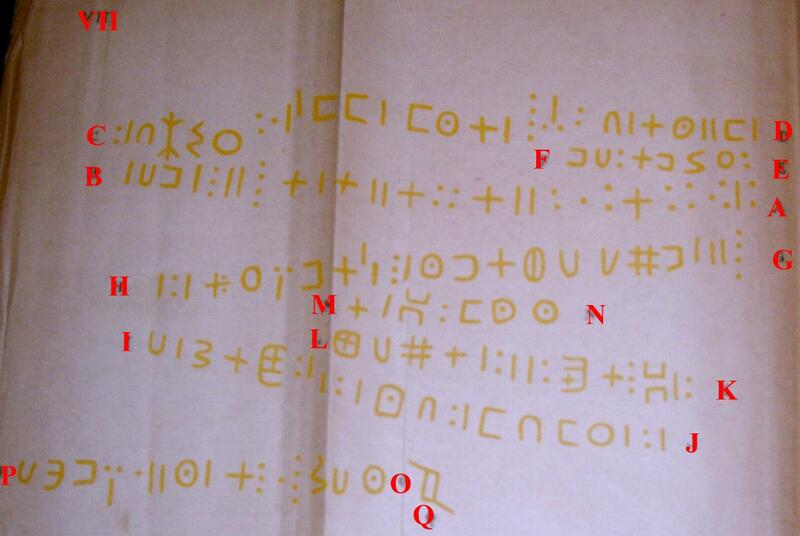 They write below or above the first sentence. If there is free room white on a page, they can add additional information without worrying about the resulting tangles. Reading requires a subtle analytical mind to determine the initial point of a text and to link the sentences together in the right order. As in Arabic there are no vowels or punctuations. The words are not separated from each other. There are no spelling rules. 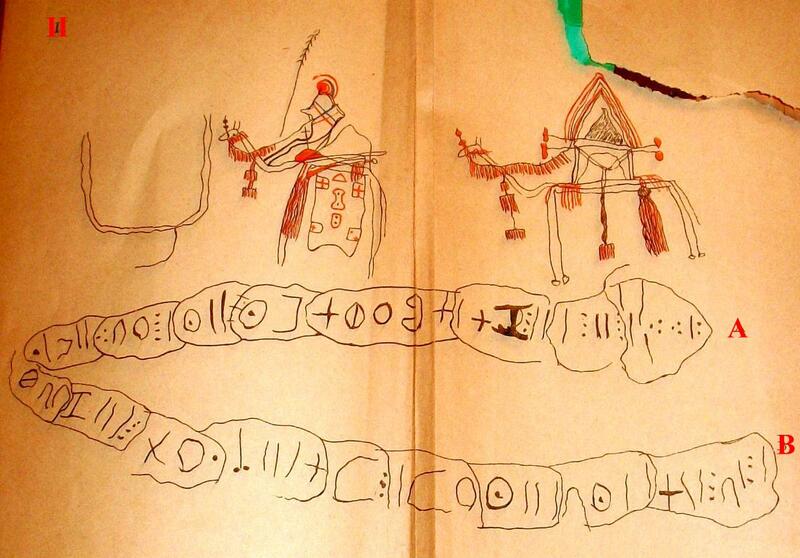 The following text is written This is me, Moummen, saying :I greet all the Chiefs from the Mzab in heading; the other lines are the same written by different persons. “What is better than playing and getting fatter, grazing the flock, surpassing the others? These words were in fact the continuation of the first seven lines. “I greet the chiefs from the Mzab and the commander, the captain, the officer, and Motilinsky. 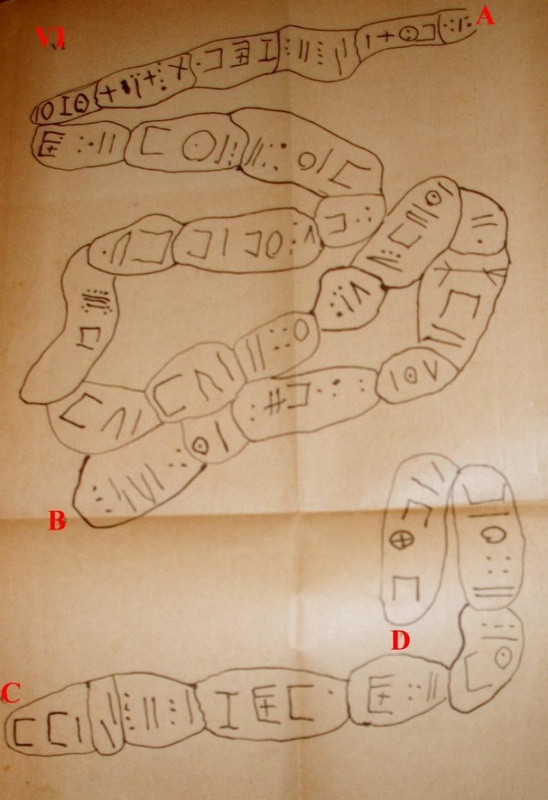 The Touareg of the Ahnet area circled sometimes the words in order to be more easily understood. 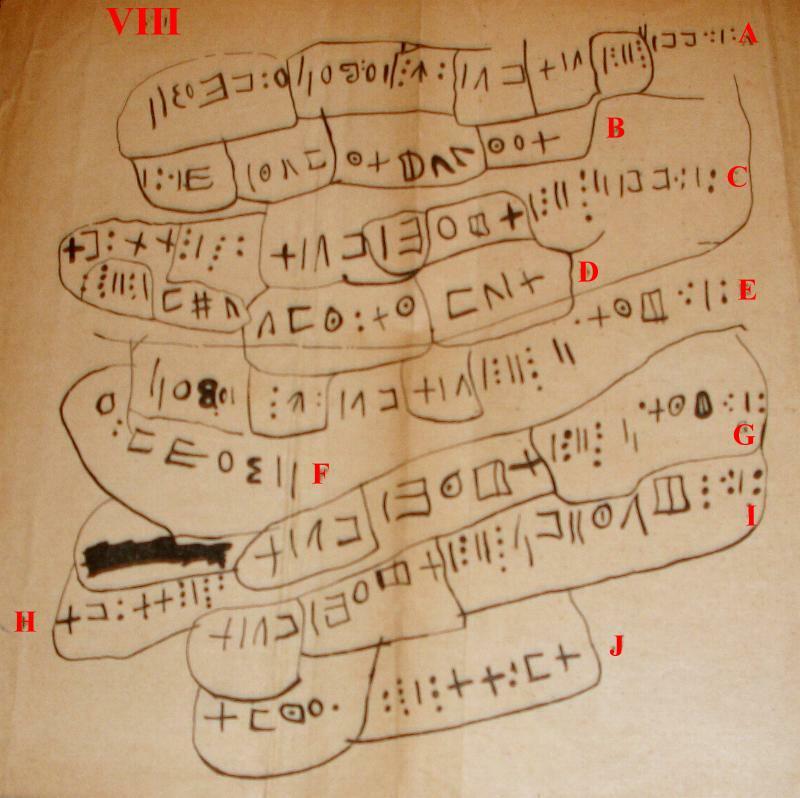 The following example will permit the analysis of a letter. This letter starts from A and ends in B. The line C-D is a post- scriptum. 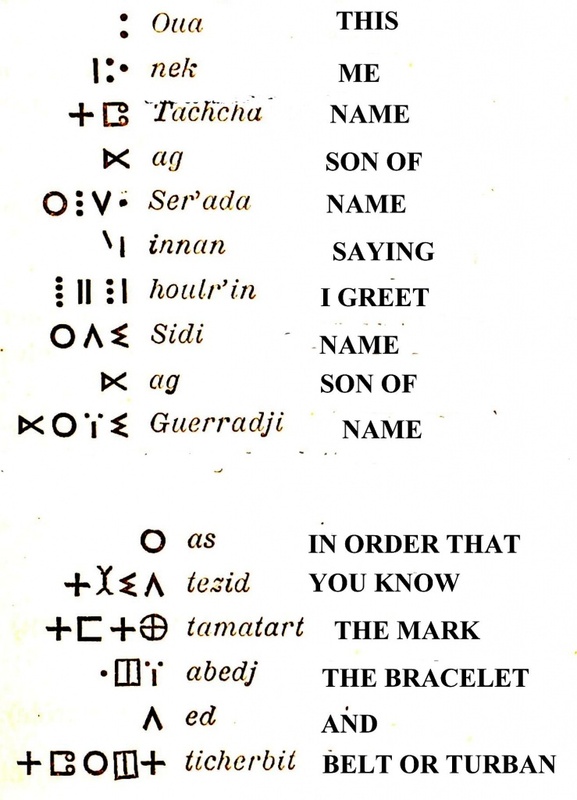 The letter are never signed but they often have a mark of recognition as here remember the bracelet and the turban you gave me or in another letter remember the ball that was sewed. 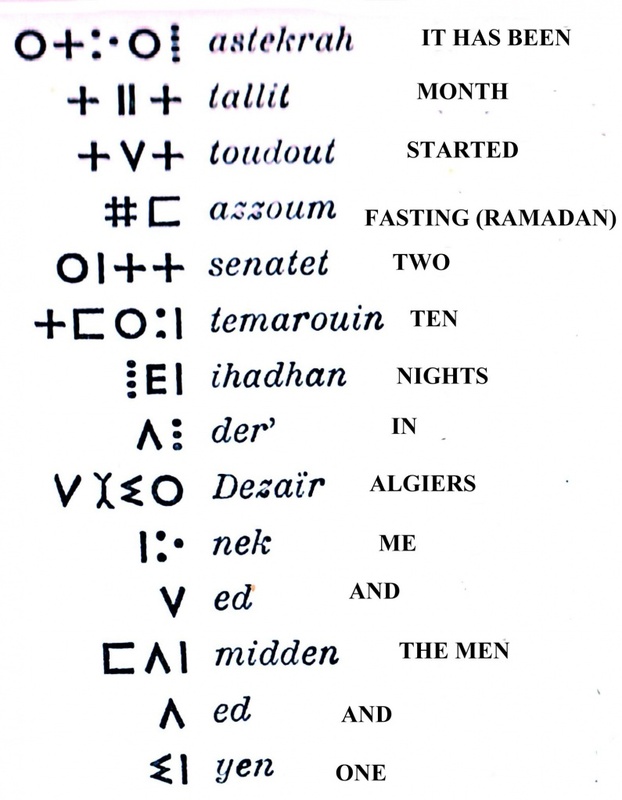 Since the men and I are in Algiers, it has been 21 nights in the month of Ramadan. The letter was written on the 22 of Ramadan or in Tamahaq the 22 of Tallit Azoum. Tihemt ouelt tanet houlr’in Aggour. Houlr’in Tachca, ed Mastan, Kenan, Moumen. Tihemt tanet houlr’in Chikkadh. Annas adounet sellamin, daren medan. Tedar Tifist ed Kheta ed Taqoua ed Biben Kella. I greet Tachcha and Mastan, Kenan, Moumen. Living Tifist and Kheta and Taqoua and Biben, Kella. I greet Tachcha and Mastan, Kenan Moumen. The left drawing is a Targui armed for war on his camel and the right one is a mehari (camel) holding a Tihadad (palanquin for women). 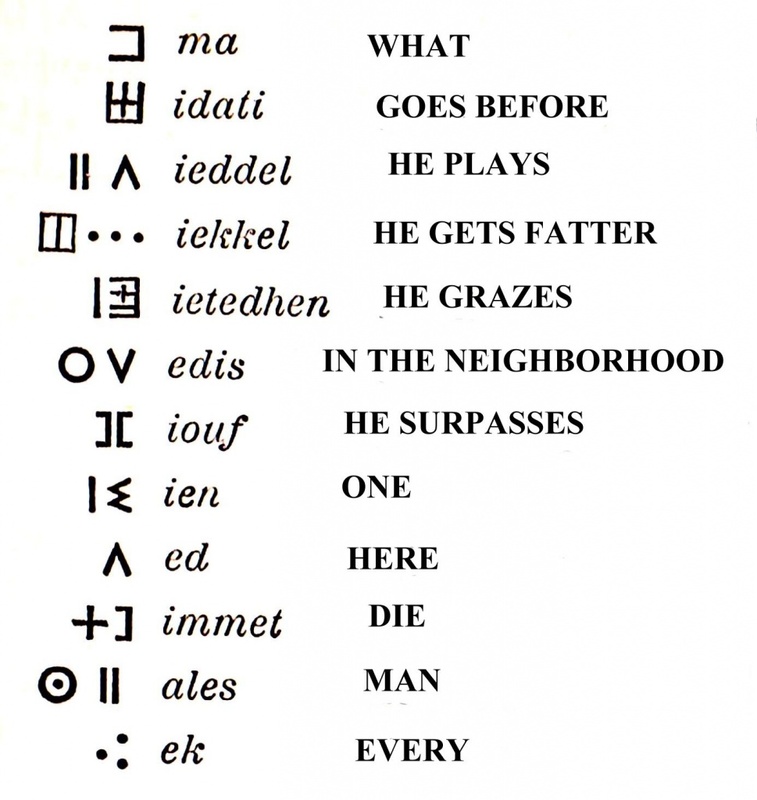 Both lines must be read from A to B.
Oua nek Kenan houlr’in el R’oftan ticherbit, Oumas allés ! nehardek limana abeded foulner’. Tira djelenet mer’ animer ? Isselan doussanin telour’ adanr’an. This is I, Kenan: greet Captain Turban*. Be a man! We know each other as friends. Make efforts for us. The letters have been remitted or not yet? When news arrives let us know. Kenan, his nephew, requested to be informed of it. Oua nek Sidi innan hoular ‘ounin temedan ; Koudit tedarem, leqtetner ‘debbara ; tat ha el féida : itatenedj ter’anem aner’iqef. Our tedjim idaouaniar ouan baradhin. I, Sidi, say greetings to all of you. If you live, inform us of condition, the value in it: we will release the head. Do not say words as children. I, Sidi, wish greetings to all of you. If you are alive, give us news in order that we stop to worry for you but do not write childish considerations. Azziouel innan houtr’in Mastan ed Tachcha ed Kenan ed Moumen ed Ihndjoued Aggour . Adounet sellamin medan . Our tarmir ‘em ouraq : ieqeder messiner’ ; ked qeder meni idiedj. Tezzaderttitoular’et. 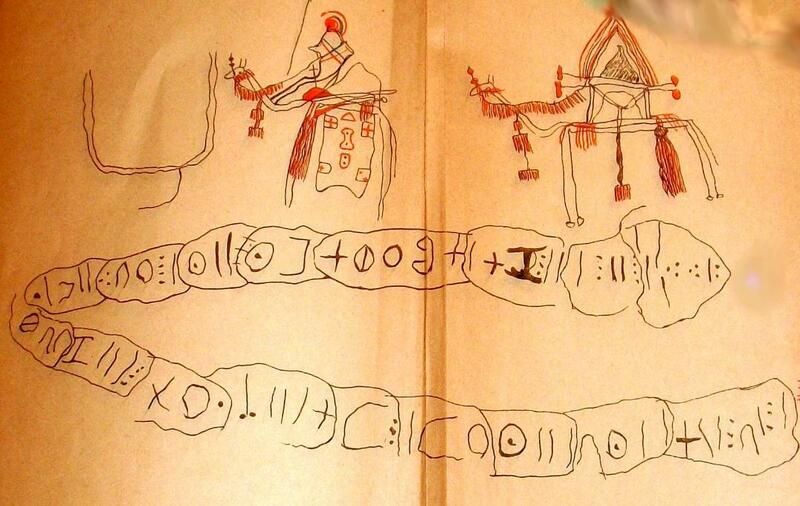 Azziouel saying, I greet you Tachcha and Mastan and Kenan and Moumen and Ihndjou and Aggour. People safe and healthy all. Don’t be afraid. Our Lord have decided. If he decide,we will see each other again, we will meet. Hope is the best. I, Azziouel, send my greetings to Mastan, Tachcha, Kenan, Moumen, Ihndjou and Aggour. Everybody is in good health. Good wanted it so .If God wants we will meet aand see each other again. Hope is the best thing. Oua nek Tachcha innan Houlrin Kenan ed Moumen ed Chikkadh ed R’bd es Sellam ed Bou Setta ed Mastan .As tezim tamatart : takerikera tin keroudhan ; as adounet sellaminnmedan an El Ouadhtia ikessa. Ag Ahnet , bahou innin abat. Ihndjou Ag Ahar iddar.Our ‘irin ouadem oullien, Khemadan Messiner’ ! Ar abaradh ouan R’ali, Sidi, abat, ouan dheren. Ikhenoukhen our dioussi. Tifinar’ dider’ Salakhedqenet neketeb. Adounet ouarin ar el Kheir medan. Nek, Tachcha, Kenan, tatoub abadah, isseler’. This is I Tachcha, saying, I greet Kenan and Moumen and Chikkadh and Abd es Sellam and Bou Setta and Mastan. So you know the proof ball that we have sewn: for healthy people all, in El Ouadhtia it looks green. Ag Ahnet, lie saying he died. Ihndjou son of Ahar is alive. Dead only one of them, Praise to our Lord! Except a young child of R'ali, Sidi, he died and that of Agouam, he died, the little one. Ikhenoukhen did not arrive. 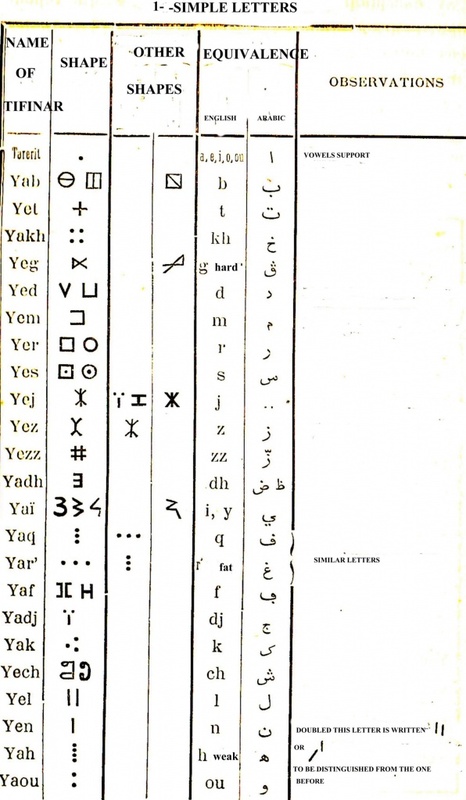 The letters, these, we have written in Salakhlà. I Tachcha, Kenan, always faithful I heard. I,Tachcha, greet Kenan, Moumen, Chikkadh, Abd es Sellam, Bou Setta and Mastan. As a sign of recognition between us, remember the ball that we have sewn. Our companions are alive and healthy and are in El Ouadhtia where there is a lot of pastures. The information indicating that Ag Ahnet is dead, is false, Ihndjou Ag Ahar is alive too. Nobody died among us, Praises to our God! But the young child Sidi, the son of R'ali died as well as the youngest son of Agouam. Ikhenoukhen did not arrive yet. We wrote these letters in In Salah., Everyone wants peace. For Kenan: I, Tachcha, heard, that your wife is always faithful to you. Oua nek, Mastan, innan houlr’in Fadhtma tahiladjet seferan. Dhetekel messiner’ el kheirnem ; kem ed r’er-menem meda, Houllenkaminmiddenmedan. El kheir ouadjid doumedmessanila djamildessenouakmatouïn ness akal nener’. Moumen innan houlr’in Fadhtma. Dhtekel messiner’ el kheirnem.Ternemertenem. I, Mastan, saying I greet Fathma (name given to Sister Josephe) you have used the remedies. Increase our Master the property of you, you and the people of you completely; we greet you, men all. The Well, you have made to our companions was good for us.. We remember when (the) in the land of us. I, Mastan, greet Fathma (name given to Sister Josephe) who healed me. May God increase your property! We all greet you and yours. The well you made to our companions was good to us and we will not forget it when we return in our land.. I, Moumen, I welcome Fathma. May God increase to well! Thank you. Oua nek Khetoua ouelt Khatel tennit houlr’in middenouan Djedjaïr : Kenan, Moumen, Mastan, Ihndjou. Adounet sellamin ; our imout oudem. Ihoullin imzad ! iadoubet Messiner’innin tamedjriout nouan. Edni tidhtaouin nouan. Tezzidert tenafa messis. Sidi iha rât ; nesella idjemoudhet. I, Khetoua, daughter of Kathel, saying, I greet those men in Algiers: Kenan, Moumen, Mastan, Ihndjou. I greet Imzad. He is able our Master to free you. We will see the eyes of you, for they will be happy parents of you. We want the eyes of you. Patience is useful to man. Sidi is in R'ât we learned, comes back. I Khetoua, daughter of Khatel, send my greetings to the companions of Algiers: Kenan, Moumen, Mastan and Ihndjou. Everybody is alive and healthy- none died. Hail O my imzad (one rope violin- which means she will phays again Imzad when the will be back), God is powerful and may free. We will see you and your parents will be happy. We languish your return. Patience is useful for human beings. We have learned that Sidi is in R'ât and that he will come back soon. Oak nek moumen innan adounet medan ouinder’ neroucharnin ar ouio medhrouinin . Nekenidh nesellem as tebeded Sarat. Oua nek Moumen innan houlr’in tibaradhtin medanet ouahner’tetoumet ;houlr’in imzad ed messaoutis medanet. Oua nek Bou Setta innan houlr’in adounet medan ouinder’ nerouchanin ar oui medhrouinin. Oua nek Bou Setta innan houlr’in tibaradhtin medanet ouahner’ tetoumet. Oua nek R’bd es Sellam innan houlr’in tibaradhtin medanet timessera ouahner’ tetoumet. I Moumen saying I greet all people, from older to younger. We, we are alive and healthy when Sarat.is mounted. I Moumen saying I greet all girls. Do not forget us. I greet the Imzads and their mistresses all. I Bou Setta saying I greet all people, from the oldest to the youngest. I Bou Setta saying I greet all the girls, do not forget us. I Abd es me Sellam saying I greet all the young girls, the girls to marry. Do not forget us. I Moumem, greet everyone, from the oldest to the youngest one. We are in good health at the beginning of the month of Sarat (beginning on January 23, 1890). I Moumen I greet all the young girls. Do not forget us. I greet all those who play the Imzad. NB: Imzad means together violin and hair. In this context it could mean all of those who have long hair, that is to say all women. I Bou Setta greet everyone, from the oldest to the youngest one. I Bou Setta, greet all the girls.Do not forget us. I Abd es Sellam, greet all young girls and nubile girls. Do not forget us.